We all know that dads are big kids at heart. This Father’s Day treat dad to a visit to Legoland Westchester. 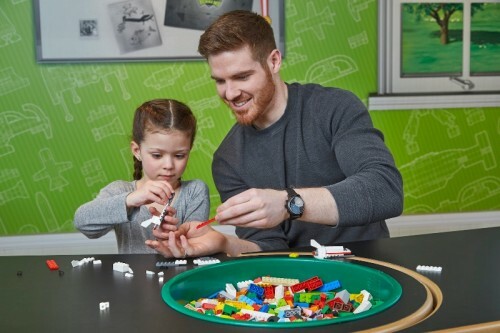 Legoland Discovery Center Westchester is treating dads to free admission this Father’s Day weekend with the purchase of a child ticket. Legoland has tons to offer the whole family including a theater, 2 rides, play area, Miniland, building workshop, cafe, store and lots of building fun. Read my full review from my recent visit to Legoland Westchester for all the inside tips. Dads can have a hands-on experience building Legos, participating on rides, watching the Lego movie and just having fun with their kids! Not able to make it this weekend? I’ve got you covered. Enter to win a family 4-pack of tickets to Legoland Westchester. The winner will also be notified through email. The winner will have 48 hours to respond by email with his/her name to claim prize. If he/she does not respond in the designated time he/she forfeits their chance at the prize. A new winner will be chosen.